Ryan Myers is an associate with Lind, Jensen, Sullivan & Peterson, P.A. Whether defending professionals facing malpractice claims, employers in thorny employment suits, or businesses engaged in “bet-the-farm” commercial litigation, Ryan’s primary focus is to identify the pragmatic, thoughtful solutions that are custom-tailored to meet the clients’ objectives. 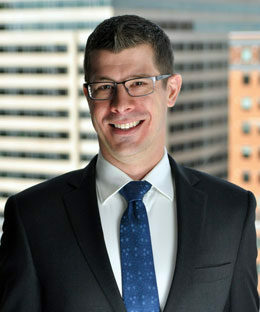 Ryan served as a member of the Lind Jensen team representing a prominent member of the Minnesota business community, obtaining a series of wins against an Oklahoma energy interest in court that established his client’s rights to nearly half of certain silica sand deposits in Goodhue County, Minnesota. In June 2013, following a week-long trial, a jury determined the Oklahoma energy interest had intentionally interfered with his client’s rights in the silica sand deposits at issue in the case. As an employment counselor, Ryan provides Minnesota employers with sound, strategic advice to employment issues arising out of Title VII, ADA, FMLA, and other laws, meant to head off a lawsuit before it is even on the horizon.